The Bridge Engineering Section of the Oregon Department of Transportation (ODOT) developed a structural health monitoring (SHM) program to facilitate the maintenance and performance monitoring of selected highway bridges. 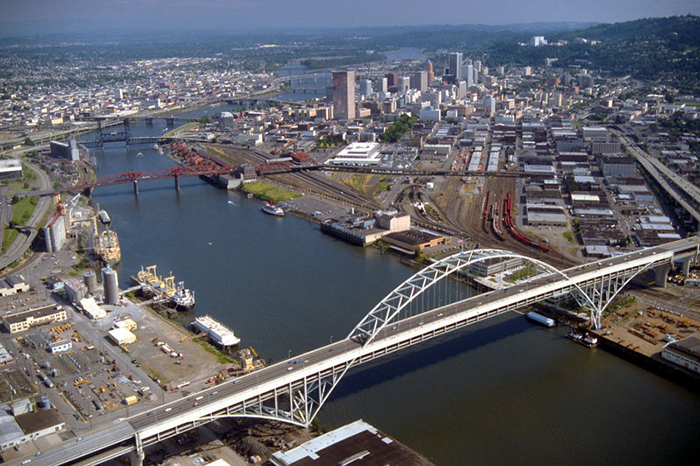 As part of its statewide SHM program, ODOT wanted to improve their understanding of the fatigue cracking of the Fremont Bridge in the heart of Portland. The Fremont Bridge provides access across the Willamette River for Highway 30 and Interstate 405 traffic. This steel-tied arch bridge spans approximately 2,150 feet and has the longest main span (1,255 feet) of any bridge in Oregon. Because this complicated superstructure has 11,500 horizontal web stiffener terminations inside two arch tie girders, it was difficult for ODOT to determine the exact cause of the fatigue cracking. ODOT consulted with Engineered Monitoring Solutions (EMS) to design and install a monitoring system that would help determine the cause of the fatigue cracking. EMS installed eight CR800 dataloggers and a variety of sensors (including 64 sensors measuring strain and surface temperature) along the tie girders on both sides of the bridge. This system monitors the stress cycles in the tie girders due to thermal loading. The networked Campbell Scientific dataloggers performed calculations on the collected data and communicated with the system via an RF450 radio network. Using an onsite CR1000 datalogger as a gateway, the tie girder data was relayed hourly to ODOT’s computer network for review by bridge engineering personnel. From the extensive data that was collected, the engineers were able to prioritize their retrofitting efforts for the Fremont Bridge.